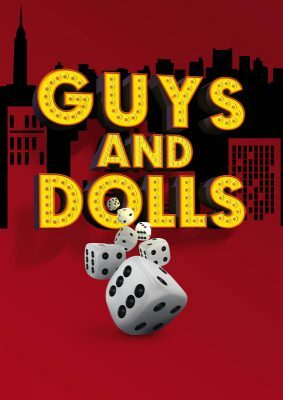 Auditions for "Guys and Dolls"
“Guys and Dolls” is a Pulitzer Prize and Tony Award winning musical based on the short stories of Damon Runyon. It is set in the 1950s and follows the adventures of a group of gamblers and hot box dancers with Sergeant Sarah Brown and the Salvation Army working to save the souls of these shifty characters. Music and Lyrics are by Frank Loesser and the Book is written by Jo Swerling and Abe Burrows. With memorable songs such as “Fugue for Tinhorns”, “Luck Be a Lady”, “Miss Adelaide’s Lament”, “Bushel and a Peck”, “Sit Down, You’re Rocking the Boat” and the Title song “Guys and Dolls”, this show is sure to be a colorful romp through the New York underworld and back. Auditions will be held at the Gualala Arts Center on September 17th from 1 pm to 4 pm with Call-backs on Sunday, September 18th from 10 am to 1 pm. Individuals auditioning should prepared to sing a song from the show and read a scene based on specific characters. Sides will be given at audition, but you are encouraged to contact Bryn Harris for a perusal script prior to audition. She can be reached at (707) 884-4386 and scripts can be picked up from the Gualala Dance Center located between the Dolphin and the Old Post Office Building in down town Gualala. Performance dates are March 23rd @ 7 pm, 24th @ 2 pm and 7 pm, 25th @ 2 pm, March 30th @ 7 pm and 31st @ 2 pm and closing @ 7 pm.